STOKESDALE — It’s the human version of cats rule and dogs drool. In this case, though, it’s a contest between fifth-grade girls and boys. Students in Pam Lindsey’s fifth-grade Academically Gifted class are learning how to grow leafy greens inside the classroom – and they’re enjoying the spirit of competition in the hands-on process. Ashton Parsons, left, begins separating the greens from the roots in order to weigh the harvest of garden cress. Teammate Spencer Knight provides quality control to ensure no soil is mixed in with the greens. The weight of the dirt could skew the data, including the weight of the harvest, collected by the students. There is a multi-faceted goal behind the idea of implementing the ReBuildUp curriculum at Stokesdale Elementary School. First, it provides a unique way of learning science and math. 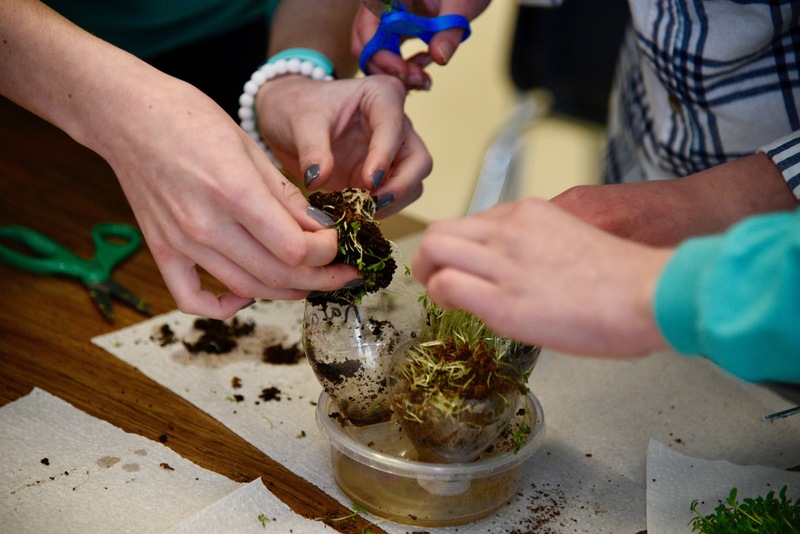 Second, it helps children in grades 3 through 12 across North Carolina to understand the importance of soil quality. Third, it helps students gain confidence and understand they can easily grow food in their homes even if they do not live on a farm. And fourth? Well, it’s just plain fun. Most of the fun for the boys and girls in Lindsey’s AG class, which meets for one 90-minute session each week, is in seeing which team can harvest the most crop. Whether it’s beets, radishes or garden cress, students work collaboratively to extract as much of the crop as possible while leaving the roots and soil off the scale. The competition is a two-step process. Each team in Lindsey’s class vies for the largest harvest, measured in grams. Then the classroom scores are sent to Michael Norbury at Greensboro-based ReBuildUp. Norbury then pits each school’s scores against another in a monthly YouTube video reminiscent of 1980s-style video games. Norbury, whose nephew David Michaux is in Lindsey’s class, said the concept is to help teach children how to grow greens in their own homes with common household products such as recycled plastic water bottles. With a coconut-based solution put into the soil and cinnamon to ward off bacteria, LED lights are used to expedite growth. The three-person team of Carley Allred, Kara Rumple and Molly Edmisten carefully remove garden cress from the roots and soil from the week’s harvest. Norbury called the classroom farming method the “wave of the future,” and especially useful for schools on lean budgets. “Some of these high-end schools will have these huge set-ups,” Norbury said. But another school might not have the budget. “Now we can teach this stuff using stuff they already have,” Norbury said. Many of the students in Lindsey’s class did not seem to focus on recycling or soil quality, however. 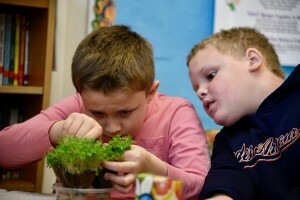 Instead, they eyed their classmates with guarded optimism as they harvested their garden cress and put it on the scale in front of Lindsey. They waited, with bated breath, as a student called out the weight of each team’s harvest. The trio of Carley Allred, Kara Rumple and Molly Edmisten were confident in their success with garden cress based on previous weeks’ results. The team claimed to be the most competitive in the class – and one male student objected. “But they’re girls,” he claimed. David Michaux shows the class harvest sheet for the first two crops grown in Pam Lindsey’s fifth-grade Academically Gifted classroom. It was Michaux’s uncle, Michael Norbuy, who helped bring Greensboro-based ReBuildUp, a Classroom to Food Market Pipeline project for students in grades 3 through 12, to Stokesdale Elementary School. This week they did not, much to the young ladies’ dismay. “Yeah! Someone finally beat the girls” exclaimed another student. Michaux, for his part, said he liked farming inside the classroom. Norbury and ReBuildUp also offer financial literacy classes and tie in other components, such as marketing, into the curriculum as well. Lindsey, meanwhile, helps the students work through the figures to compare, contrast and measure for accuracy. The bounty grown at school cannot be eaten by the students due to health regulations, Lindsey said. “This would turn into a salad if done at home,” Lindsey said. So once each team’s harvest has been weighed, it is squeezed into a container for Jake Priddy to take home and feed to Sheldon, his pet turtle. While they offered the reptile a greens-based diet, some were worried he’d overeat. “Sheldon’s going to be very obese,” cautioned one student. For more information on ReBuildUp, visit www.rebuildup.com. Editor’s note: This article and accompanying photos were originally published in the April 5 edition of the Northwest Observer. It is being published here, with the author’s permission, in order to give appropriate professional credit to the author and photographer.